Graffiti is a polarizing phenomenon. For decades, its presence has fueled intense debate. For some, graffiti evokes fear and is viewed as strictly criminal vandalism; a destructive attack upon an otherwise clean and orderly society. For others, graffiti is seen as a natural form of human expression, a sign of a vibrant modern culture, and an important form of grassroots resistance. By definition, public space is supposed to be open to everyone. The quality of our public spaces, and the degree of access we have to them, speaks volumes about what we, as a society, believe to be important. Access to public space is important because these spaces serve as the only real arena for common democratic actions. Across various municipal entities, the City of Portland spends an average of $2-5 million a year on graffiti abatement and removal. The City’s Graffiti Abatement Program (GAP) began in 2007, operating under the Office of Neighborhood Involvement (ONI). GAP employs one full-time program coordinator and a part-time assistant, who manage the program and organize volunteers to carry out periodic graffiti removal “sweeps” of Portland. ONI allocates approximately $40,000 a year in community grants for graffiti abatement and prevention ($42,000 in 2010, $40,000 in 2011). Like many cities, it has codes regulating the sale of “graffiti materials,” such as spray paint and markers. It also has a Graffiti Nuisance Property Code that requires all reported graffiti to be removed within 10 days, or the property owner faces fines of $100 a day for everyday the graffiti remains. The City essentially operates under a zero tolerance policy where any graffiti reported (that does not have a city-issues mural permit or waiver) is required to be removed. Many of these reports come in through the City's Graffiti Hotline and the PDXReporter smartphone app. GAP works in partnership with the Graffiti Task Force that meets monthly and consists of two dedicated full-time police officers who investigate graffiti crimes, public agencies and district attorneys. Although they have publicly stated (at the 2013 and 2014 Graffiti Abatement Summit) that the main focus of the graffiti police officers is to investigate gang graffiti crimes in East Portland and other urban outskirts, many in the community say that the officers focus more effort on easier and more visible targets, such as street art and graffiti in inner Portland and in the downtown core. The officers have come under public scrutiny for targeting street art collectives and owner-permitted works. Another key player in Portland’s graffiti abatement scene is the newly created Friendly Streets, a non-profit entity that promotes livability and works in partnership with residents, businesses, public and private agencies, local officials, utility companies and others, to foster safe, attractive, and well maintained city streets. Marcia Dennis, the former head of GAP, is the vice president of Friendly Streets and one of the board members is the owner of a for-profit graffiti removal company in Portland called Graffiti Removal Services. Portland taxpayers spend between $2 to 5 million annually on graffiti abatement. In 2012, Portland spent $3 million on graffiti. Cities across the U.S. spend between $12 to 25 billion on graffiti abatement every year. Many cities now outsource graffiti abatement. For-profit private graffiti clean-up companies are increasingly common. Most graffiti occurs on soon to be demolished vacant buildings. Even these structures are continuously painted over (i.e., buffed). Research shows that continuously removing graffiti does not eradicate it in the long term. In tough financial times, are these expenditures justifiable? Can our tax money be better spent? Portland’s graffiti abatement program supports building felony cases whenever possible. In 2012, more than 100 people were arrested in Portland for graffiti. Are felony charges really the best approach to prosecuting those caught doing graffiti? Do felony charges really deter graffiti or prevent repeat offenses? Portland has a ‘zero-tolerance’ graffiti policy requiring that all un-permitted public expression be promptly removed. If issued a citation, Portland property owners are required to remove graffiti within 10 days or face search warrants, fines, and possible imprisonment. These policies are relatively new, and are based on the "Broken Windows" theory. Even though it did not directly reference graffiti when developed in the 70s, this theory is used by law enforcement to suggest that graffiti actually causes urban decay, the collapse of moral values, and physical violence. If anything, graffiti arose as a response to, or a by-product of, urban disinvestment and desperate situations. Research, including studies done by Harvard Law Professor, Bernard Harcourt, show that the broken windows theory has not been proven or adequately tested. Should we blindly accept the broken windows theory? Is it right to stereotype people who do graffiti or street art as being violent criminals who lack moral values? Listen to this 2016 NPR segment about how this thoery of crime and policing was born, and how it went totally wrong. Anti-graffiti campaigns often criminalize artists and further the divide between them and the larger community. It’s a common belief among anti-graffiti activists that graffiti is a ‘gateway crime’ that leads to other more serious offensives. It’s estimated that less than 15% of all graffiti in the City of Portland is gang related. Artists who do graffiti/street art come from all demographics. It is a world-wide phenomenon. Why can’t we work to educate the public about the different forms of graffiti (and how to identify gang graffiti) so there’s less fear and more understanding of this global subculture? Portland no longer has any designated outlets for graffiti art – they have been systematically eliminated over the past 50 years. Countless NW cities (Seattle, Tacoma, Olympia, San Francisco, etc.) have free walls that are open to public expression. 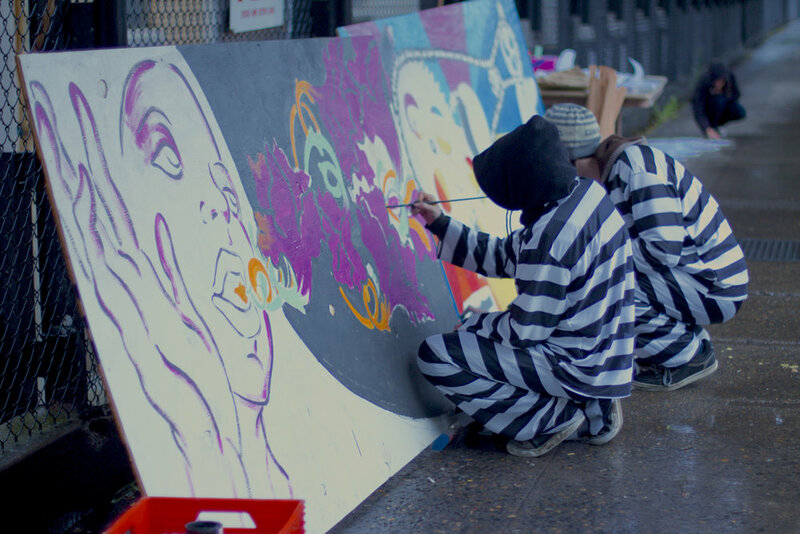 Free walls provide a designated safe place for people to practice and refine their skills. School art funding has been systematically reduced over the years, providing less opportunities for youth to express themselves artistically. Why not explore other options that provide youth the support and safety they need to develop artistic skills and the ability to interact with public space in a more acceptable way? Why not ask residents what kind of graffiti management they prefer? Would community-specific place-based graffiti management be a more effective than a blanket zero-tolerance approach? Above all, PSAA wants to promote more dialogue surrounding these important issues. The City of Portland, in many ways embraces the weird and quirky. Many of us choose to live in Portland because of its quality of life and vibrant cultural scene. We believe that allowing for more free expression in public space ensures that everyone has an equal opportunity to express themselves and be exposed to art in their daily lives. Having a vibrant arts scene is also a vital ingredient that helps the City of Portland attract creative professionals and artists who want to live in vibrant, accessible, dynamic, and safe city. Read more about incidents artists have had with Portland's graffiti abatement in our article covering the forced buffing of an owner-authorized mural by a world-renounded artist. The City of Portland' Graffiti Abatement Project periodically organizes volunteer group "sweaps" to remove graffiti on public property along Portland's main streets. 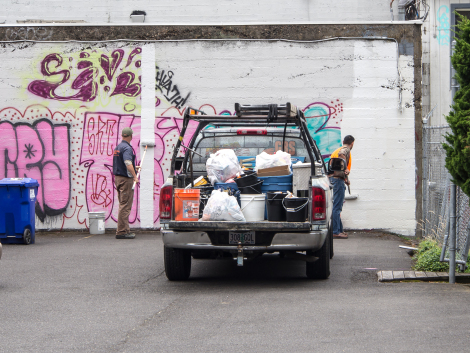 On Saturday June 28th 2014, the City of Portland’s Graffiti Abatement Program implemented a large graffiti cleanup of SE Belmont Street, between 20th and 40th Avenues. According to GAP, Belmont had been “hit hard with graffiti over the last couple of months.” Approximately 20 to 30 volunteers participated in this city-sponsored event, which provided graffiti removal training and a free continental breakfast. A group of anonymous street art advocates participated in this community event to get a ‘sneak peek’ into Portland’s graffiti abatement efforts. As Morton’s clean-up crew moved down the street, they documented and provided satirical commentary about the politics of graffiti and graffiti removal; even going as far as interviewing a few passersby for their opinions. The next day, PSAA was sent the video below, and interviewed Morton and the other volunteer art advocates who participated in the Belmont Graffiti Cleanup Event. In a classic détournement style, these advocates lightheartedly and subversively participated in an event that they would not have normally participated in. They wanted to see what was going on, and learn more about graffiti abatement tactics. PSAA would like to thank all the community members who participated in this neighborhood event, whether they were wearing orange vests, or simply having a conversation about what was happening around them. Strong communities are made up of an active and engaged public, so regardless of our opposing opinions on the issue, we’re happy to see people outside trying to “improve” our shared public spaces. After speaking with participants of the event, PSAA like to pose a few questions for the city to consider: first, why spend time and money funding events that focus on scraping stickers off the back of street signs? As long as the front of the sign stays clean (for obvious safety and informational reasons), why not meet us halfway – let the community put art on the back of our street signs. Seattle takes this moderate approach, why can’t Portland? These signs are, after all, public spaces. Second, why not focus more on removing (and fining) illegal profit-driven advertisements? Ads vandalize our public realm, often without penalty. The same is not true for community members who choose to speak through art on the streets. PSAA would like to encourage Portland artists and advocates to engage with not just their peers, but reach across the aisle and talk to the City and your neighbors. Try to understand their perspective and tell them about your perspective too. Even though we have differing opinions about how to best maintain and manage our shared public spaces, we should try to find commonalities and work together in whatever shared spaces we can. PSAA: Why did you guys participate in the Belmont Graffiti Cleanup Event? Morton and Friends: We wanted to help our community, make it a better place. We love our city and we want to change the world we live in. We wanted to remove blatant and illegal advertisements, in addition to stickers that were old, worn, and tattered. We saw this as cleaning the canvas, making way for fresh DIY art stickers. We also wanted to see what graffiti abatement was up to and how they managed events like this. PSAA: Why do you think the City of Portland sponsored this event? Morton and Friends: At the event, the main reason the City said graffiti removal was important to do was to make sure that tourists were not scared away from visiting certain Portland neighborhoods. As far as the focus on Belmont, who knows… they said it had been “hit hard,” but really Belmont doesn’t have any more graffiti than any other popular Portland drag. PSAA: What were you and the other volunteers asked to do? Morton and Friends: We were told to focus on removing stickers and a bunch of anti-abatement protest signs that had been put up along the cleanup route. When we questioned the organizers about why they were not removing ALL the other flyers on the poles, they told us to not worry about those and just focus on the anti-abatement signs. We thought that was weird because as flyers are illegal postings too. Otherwise, volunteers were told to focus on removing stickers from poles and the backsides of street signs. PSAA: So they said to only remove stickers from the back of signs, what about the front of signs? Morton and Friends: If the front of a sign had stickers on it, we think the entire sign was replaced in a lot of cases. I guess the solvent can damage the reflective coating on the signs, so they just have to remove and replace the whole thing. The cleaners they gave us did a good job removing the stickers pretty quickly, the stickers mostly slide right off. If the sticker didn’t come right off, they said to just scratch and destroy the sticker enough to make it unreadable. PSAA: What did you take away from participating in the Belmont Graffiti Cleanup Event? Morton and Friends: Surprisingly, we came away with a new understanding for the similarities between graffitists and graffiti abaters. Both want to make an impact on our community and make a positive difference. Both act to change the aesthetics of their environments. Both feel like it helps their sense of community. The main differences (between these two communities) are that aesthetically, one likes seeing community interventions and art, and the other, likes a blank, and in our opinion, very sterile environment. Also, one group uses the streets as a space to exert their right to free speech. The other group sees it as their duty to suppress this speech in the name of the law. We all felt like we were making a difference in the world!